Add four to five slices of fresh ginger to about one liter of water and simmer for 15 to 20 minutes. Then pour the ginger water into a thermos flask and drink it as hot as comfortable, half a cup every half an hour or as possible. This will stimulate your digestion noticeably and make you feel fresher and lighter. In general, Ayurveda classifies cow’s milk and products such as freshly-made yoghurt as “Sattvic”, i.e. promoting life, in contrast to mucus-inducing and harder-to-digest sour dairy products such as cheese, quark, soured milk, etc. The milk should be organic, ideally in Demeter quality and coming in a glass bottle. Fresh milk should generally be boiled briefly – preferably with aromatic spices – and consumed warm. But in the next few weeks it’s good to use less milk. 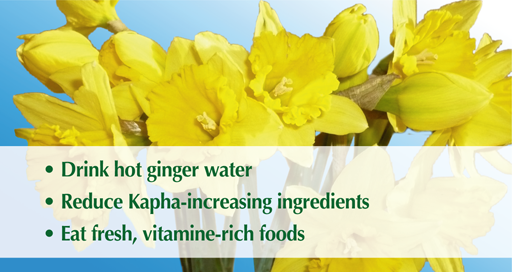 Especially try to avoid sour dairy products, as well as heavy foods such as meat, fish, deep-fried and canned food – this way, you’ll be on the safe side concerning your Kapha balance. Make sure to eat fresh, natural vitamins, which means you can enjoy fruits and vegetables as much as you want. The vegetables (and also some fruits) can be cooked, as long as you don’t overcook them! Although some vitamins are lost during the cooking, it’s much easier for the stomach and intestines to absorb vitamins from cooked food – so effectively your vitamin balance is better with freshly cooked vegetables than with raw food.